Th-INK-ing of You: Peace, Love & Joy Christmas wishes! Hi there friends! It is time for ODBD Stamping In Time Challenge (SNTODBD48)! The assignment is to use Our Daily Bread Design stamps. The challenge this rotation is to create Christmas cards, gift packaging, gift ideas or anything festive you can think of to share with a Christmas theme! Remember, the more you play the more you increase your chance to win! We look forward to seeing what you create using ODBD stamps! I have used this month's newest release, Sacred Season. I just love this set and decided to stamp the image and sentiment on the same piece of card stock, using Memento Ink. I colored the image with Copics and then added Liquid Applique, sprinkled with glitter while wet, then dried with my heat gun, giving the puffy effect. The background is created with a Sizzic embossing folder/stamp combo, which I stamped with Distress Ink in Forest Moss. I used the Spellbinders Holly Accents, 2 MS edge punches for my lower edge (pine boughs and holly) and layered them. The base is Bazzill and the matting is Recollections Brushed Gold. Hello Grace, this is a really beautiful card, so elegant. I saw it on MIM and just popped over too have a peek. Totally gorgeous Grace!! I just love that holly embossing folder and your use of the holly border die!! The pine cone corner is perfect! !Stunning and so elegant my friend!! Thanks for supporting the ODBD Shining the Light challenge my friend. You know how I treasure you!!! Gorgeous card, Grace! So many layers, delicately accomplished! Love your rich, elegant coloring, too. Your card is absolutely gorgeous, Grace! I love all the embossing and the wonderful Christmas sentiment! Hope you are well and that things are settling down! OMG!!! Adorable card.. Looks soooooo perfect with colours, embossing and colouring.. Fantastic work.. Love everything especially the embossing and the pine cone corner..Its amazing..No words to say..I love it soooooooooo much..
Gorgeous Christmas card! Love all of the "extras" you do! Thanks for sharing at Speedy the Cat's Challenge! Absolutely beautiful. I love how you made the snow, but also what you did with the embossed background. It almost looks as though it were cut out too. Thanks for great inspiration. A very stunning card. Love the detail and colors. Thanks for sharing. This is amazing! The texture and depth are wonderful, Grace. Beautiful colors and images. Hugs! Gorgeous card, love the embellies and the fab sentiment, The "snow" is very effective on your pinecone too. What a beautiful and elegant card!. Love the frosting of snow on the pine cone - looks so real in appearance! Quite lovely.Thanks for joining this week at Pile it On. Grace, the colors and details are stunning! Love the snow! Wonderful Christmas card! Grace, this card is just breathtaking! Your holly BG - embossed and colored! wow!!! Love the snowy accents on the pine bough, and these new(?) spellbinder borders - they are a real eye catcher! What a beautiful Christmas message - love this set!! 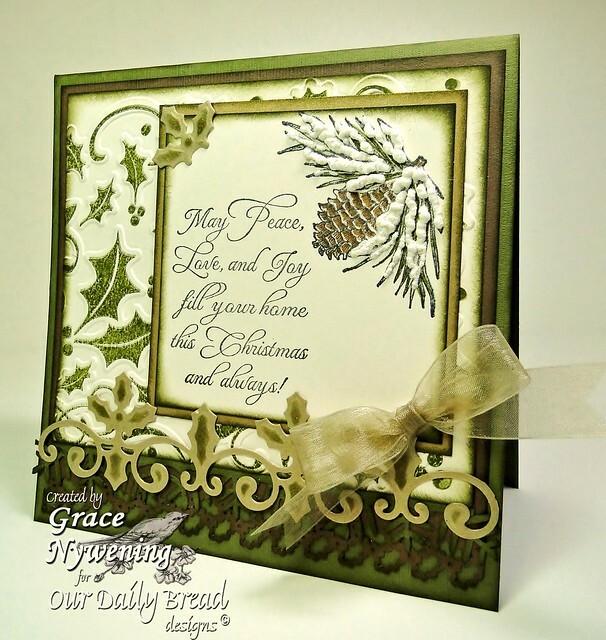 Grace this is fabulous - love your colours and texture, and the sentiment panel is just so elegant. Special mention for the sentiment ,it is beautiful . Grace, I just scrolled down several of your posts, and you have been busy! They are all beautiful! I love this pine cone card especially! I'm getting in that "spirit"! Gorgeous card Grace!!!! Your cards are always such a pleasure to view! Thank you for playing along with us this week at Speedy The Cat's Friends Challenge. Wooaaw, this is a wonderful card!! I totally LOVE it all! this is a lovely card. Thanks for playing in Speedy's Challenge. I just love all of these green tones. Thanks so much for joining us at Hooked on Craft.